Food Vale held its inaugural Engagement Event on 9th of November 2017 at the St Donat’s Art Centre, Llantwit Major. A new partnership aiming to celebrate a holistic approach to food, Food Vale promotes engagement and collaboration with local growers, health, food producers, food retailers, hospitality and catering services from across the Vale of Glamorgan. The event was attended by over 50 organisations including the Soil Association, Farmers Union of Wales, Cardiff and Vale University Health Board, Age Cymru, the Amelia Trust Farm, Cardiff and Vale College, Riverside Real Food and local businesses Valerie Chicken, Glamorgan Smallholders and Cobbles Kitchen and Deli. 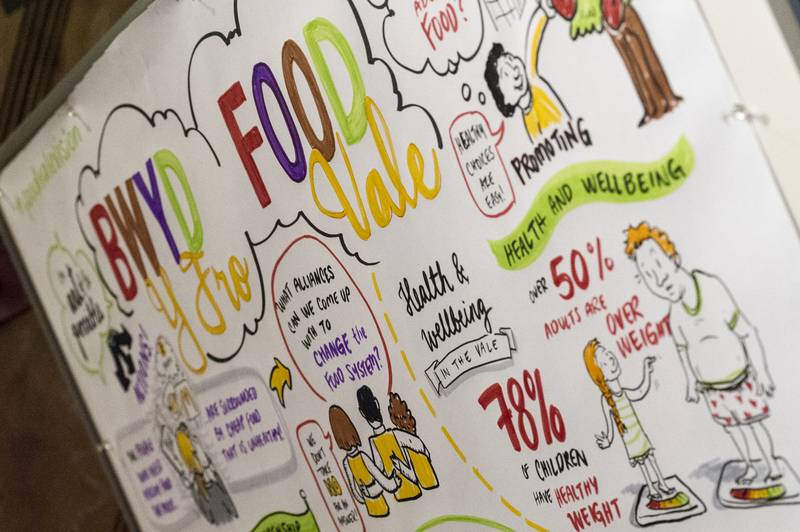 Rhianon Urquhart, Principal Health Promotion Specialist for the Cardiff and Vale Local Public Health Team said: “We are delighted at the number of organisations who are committed and motivated to collaborate and share the vision of healthy, local sustainable food. Our aims include becoming a Sustainable Food region, developing a Food Charter for the Vale and establish a wider network of stakeholders and Steering Group members. Key to this is consulting with communities and we look forward to using the outputs from today as the building blocks to achieve these goals”.